When you decide to get the granite countertop for your kitchen, then you get the unique design style and a slab that is solid igneous rock. However, how hard and perfectly build the granite stone is, it also needs maintenance from time to time. Granite is the most durable stone, more than the marble countertops and this makes them the most preferred choice for the use in kitchen. When you get the polished granite for the kitchen countertop, you get a slab that was crafted by the hands of time by nature. All these qualities makes granite the most popular stone in the market and many new home owners prefer them over every other stone option. 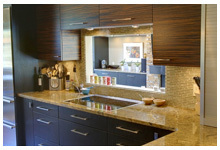 Even with all these advantages, granite needs to be taken care of from time to time, to keep it in pristine condition. Here are some of the ways to find out whether the granite needs to be sealed or not. The best way to protect the surface of the granite from all the stains is by sealing it. Sealing makes the granite virtually resistant to stains and you don’t have to worry if you spill anything from curry to wine on the countertop. You have to make sure that you are getting the sealing done from professionals. Granite countertop needs to be sealed once in every year. Many people avoid sealing the granite as it gives it a mirror type finish. Without sealing, the granite looks more natural and the grains look more prominent. If you have too much of cooking in the kitchen, then it is highly recommended that you get the granite sealed with professional methods. Here are some tests that you can do on the stone to check what kind of sealing you might need to protect the surface of the granite. Put a small quantity of paint thinner at the corner of the granite. Leave the thinner for approximately ten minutes. If it doesn’t darken the surface of the granite, then you don’t have to get the sealing done as it is safe from oil based stains. Another way to check the need for the sealing is by doing a paper towel test. Take some water and a paper towel and make sure that the towel you are using is plain, without any prints. Place the towel on the surface of the granite and soak it completely with water. Leave it on the surface for 5 minutes. If there is a dark spot beneath the towel, then that’s an indication that you need to get the granite sealed to keep it safe from water based stains. Sealing the granite countertop is an easy process and you don’t have to spend loads of time getting it done. It not only protects the granite in the long run, but also makes it a lot easier to clean on day to day basis. Make sure that you are cleaning the granite with a damp cloth after the cooking in the kitchen to keep the surface shining all the time.